Home » Product Reviews » Feeling a lot of love for The Herb Farm Hydrating Overnight Face Mask – better late than never! The Herb Farm Hydrating Overnight Face Mask – What is it? As the name implies, this is a mask that you apply and leave on overnight. Masks like these are also popularly referred to in Korean Skincare parlance as “Sleeping Masks”. 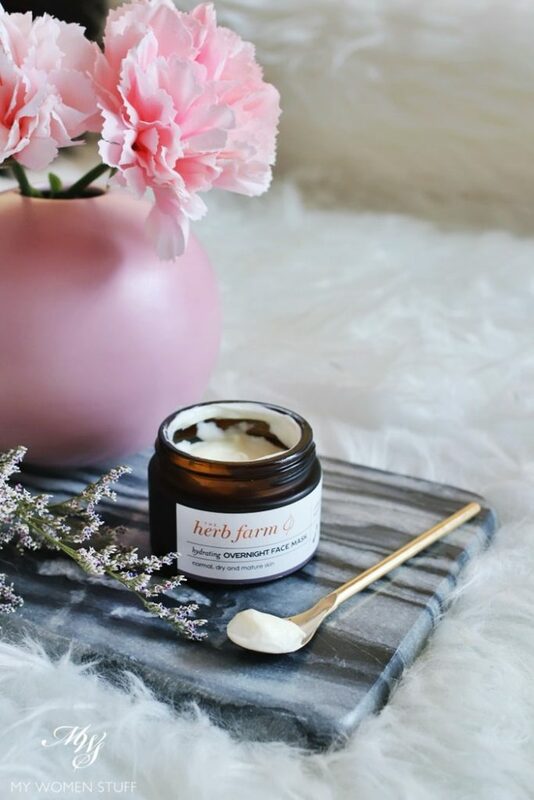 The Herb Farm is a natural skincare brand that formulates and manufactures their products at their farm in New Zealand. Yes, that’s why it’s call The Herb Farm – because that’s what it is! I hope to be able to visit one day – it looks so beautiful! It follows therefore, that the Hydrating Overnight Face Mask is formulated using natural ingredients, and is targeted at nourishing and hydrating the skin. Everything I look for in skincare products these days. Their key ingredients are the Borealine® Expert formulated to minimize lines and wrinkles, and Peony Extract, a powerful antioxidant, to repair and rejuvenate skin. It is also formulated to boost collagen support, which as we aware, decreases with age. Why use an overnight mask instead of a wash off mask? Well, no real reason except convenience of course! An overnight mask makes things easier, in that you apply it on in place of moisturiser (or even just on its own after cleansing) and leave it on till the next morning. The next morning, you rinse it off when you wash your face. I also find that a good overnight mask usually helps nourish skin and boost hydration and moisture better than a short wash-off mask. Does The Herb Farm Hydrating Overnight Face Mask work? The texture is a little thick, as you can see in the picture above. It reminds me of thick, creamy, greek yogurt 😀 It feels very creamy, which I love. However, I will have to point out that the Hydrating Overnight Face Mask might work better for those with drier skin types. If you have oily or combination skin, you might find it too heavy and rich for you. You may therefore find something with a more gel-like or water base more comfortable. But if you have normal skin or skin tending to dry, you will absolutely LOVE this! I like slathering a generous layer on my skin after cleansing, like a thick layer of moisturiser. Then, I massage it in and spread it around a little, then leave it till the next morning. What you wake up to is lovely, lush, plumped and moisturised skin. It does feel pretty amazing. I will note however, that the smell isn’t terribly pleasant to me. Because they are all natural, they do not use artificial fragrance, so what I’m getting, I think, is a blend of the various oils used in the product. Also, because it is a natural product, made without parabens, shelf-life once opened, is a little short. I’d recommend using it up within the recommended 6 month period once opened. In our heat, I’d say even shorter because there is every chance the oils might turn. But use your judgment accordingly. What I did, before boarding was head to the toilet, wash my face, and then apply a layer of The Herb Farm Hydrating Overnight Mask all over my face, massaging it in. Once massaged in, you won’t see any white cream on your face, but it will look a little glossy. I might have looked a sight, but my skin felt so comfortable in flight! It was a night flight, and so perfect for me to just crawl off to sleep. Before landing, I used some wet cotton pads to wipe my face, rinsed it, and then applied my usual skincare. In the 6 hours that I was shut in the dry air of the airplane, my skin did not suffer one bit! I’d say that if you are in the market for an overnight face mask, but are not so keen to use certain brands, because they’re too light (e.g. Laneige Sleeping Mask is too light for me now) or because you feel that you’d prefer something made with more natural ingredients, then I’d say The Herb Farm Hydrating Overnight Mask is a good option to look into. 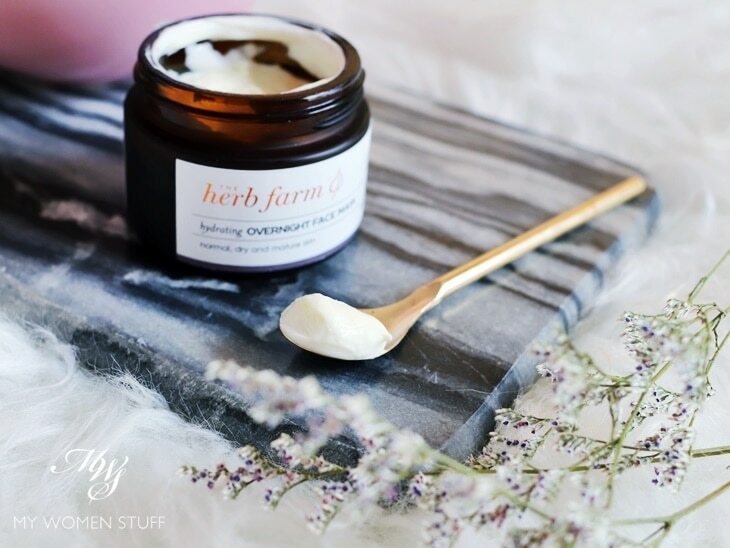 The Herb Farm Hydrating Overnight Face Mask is a cream mask that you apply on skin in place of moisturiser, and leave on overnight. Rinse off the next morning when you wash your face. While I find the scent a little nose-wrinkling (not bad, just a little ‘oily’) it does an amazing job at making skin look and feel amazing the next morning! Skin is plumped, hydrated, soft and moisturised. It makes you want to use it everyday, but don’t. It could be too much. Best for those with drier skin types due to the richer texture. Here is the ingredient list for The Herb Farm Hydrating Overnight Face Mask. Ingredients: Aqua (Purified Water), Certified Organic Linum Usitatissimum (Waihi Bush Organic Farm Linseed/Flaxseed) Seed Oil, Cetearyl Olivate, Sorbitan Olivate, Glycerin (Vegetable Glycerin), Butyrospermum Parkii (Organic Shea Butter), Ribes Nigrum (Blackcurrant) Oil, Certified Organic Cocos Nucifera (Coconut) Oil, Cucurbita Pepo (Pumpkin) Seed Oil, Oenothera Biennis (Evening Primrose) Oil, Carthamus Tinctorius (Safflower) Seed Oil, Calendula Officinalis (Flower) in Prunus Dulcis (Sweet Almond) Oil, Paeonia Lactiflora Root Extract, Calendula Officinalis (Flower), Echinacea Purpurea (Flower) and Centella Asiatica (Gotu Kola) Extracts, Xanthan Gum, Acer Rubrum Extract, Sodium Levulinate, Sodium Anisate, Cananga Odorata (Ylang Ylang) and Lavandula Angustifolia (Lavender) Essential Oils, Rosa Damascena (Rose) Absolute Oil and Citric Acid. 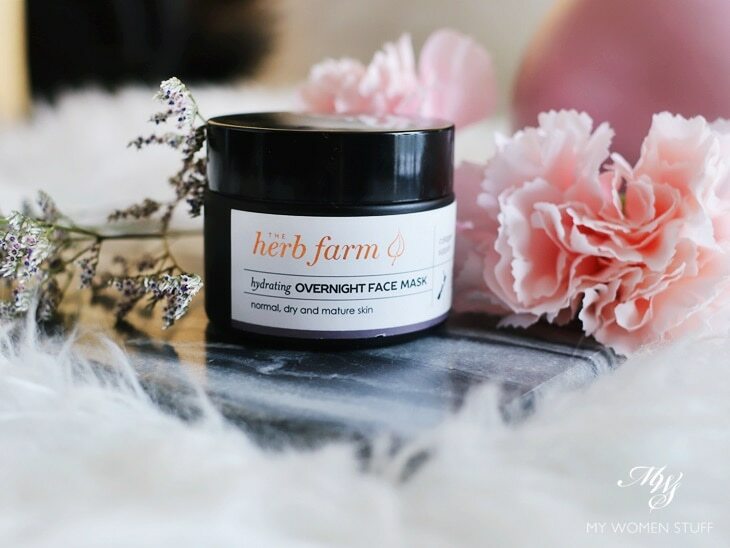 Have you tried this The Herb Farm Hydrating Overnight Face Mask? Anything else from The Herb Farm that you like? One more question though: after rinsing the mask, did you do your usuaL routine in your seat or in the Lavatory? Ooohhh, I have my own routine for this since I fly long hours pretty often. I will just carry a pack of cleansing wipes (micellar ones), a facial spray (water-based ones such as Bio-Essence or Avene), clean cotton pads, a pack of anti-bacterial hand wipes (Dettol Sensitive) and the sleeping pack (Laneige sleeping mask sachets or capsule ones from Innisfree). As soon as I sit in the plane, I will use the cleansing wipes to remove my makeup, generously spray my face and then wipe off the excess water with cotton pads. Then I clean my hands with the hand wipes before putting on the sleeping mask. Upon landing and when everyone else is distracted trying to rush out the plane, I will use the cleansing wipes to remove the mask residue, spray like mad and blot off excess water with cotton pads, clean my hands and put on a temporary face which is normally sunscreen, tinted moisturizer, cream blusher and tinted lip balm. I tend to be the last person getting off the plane every time I do this. I aim to look decent enough to survive the journey to the hotel. When I’ve checked into my hotel, I will immediately shower and do a proper skincare routine all over again. I do everything in my plane seat without a mirror even. I get funny looks once in a while but I couldn’t care less. I wouldn’t use the plane lavatory because they tend to be smelly/disgusting unless you planned your lavatory trip during boarding time or just after the flight attendants cleaned it or if you are flying business class or fancy planes like JAL and ANA. Thanks for sharing your in-flight routine Liz!